The Ground Fault Protection Device (GFPD) products are built to be both off-grid and on-grid PV safety devices. The GFPD is available in models, GFPD-150V & GFPD-600V, to support 150V and 600V PV system breaker stacks. 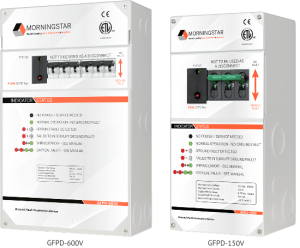 Morningstar’s GFPD increases safety and design flexibility in off-grid and on-grid PV systems. Ground fault protection is used in electrical systems to prevent current from following any unintended paths during a ground fault. It is critical to detect any stray current and to interrupt (break) the circuit until safe operation can be restored. A current imbalance between the conductors of a circuit indicates a ground fault. Morningstar’s GFPD will detect this condition and break the circuit on both the positive and negative legs. Disconnecting both poles ensures interruption of the ground fault current. Works like a traditional AC GFI. Is powered via the PV system’s battery. Is equipped with both visual and audible alarms. When the earth bond is not broken Morningstar’s GFPD will only shut off affected controller(s). Multiple controllers and GFPDs can be added on an as-needed basis.